Sliding Room Dividers Installation - Panel Systems Manufacturing | Panel Systems Manufacturing, Inc. Please contact us for a specific quote for your project. Click here to see a list of our fabric color choices. All sliding room dividers have a lightweight ceiling track, a removable floor track, wall seal angles and perimeter frames of clear anodized aluminum. SA-1000 core has two 3/8” thick gypsum boards placed back to back. Facings: tackable acoustical fabrics. A very economical divider. Maximum height is 10’. SA-1200 core has a 1” thick 4.7# stiff fiberglass board. Facings: FRP Structoglas plastic washable boards. An ideal product for clean rooms, cafeterias and other applications where sanitation is important. Maximum height is 10’. SA-1500 core has a 3/4” honeycomb board sandwiched between two sheets of 24 gauge galvanized steel. Facings: acoustical fabrics. Better at reducing noise transfer. They are very ridged and light in weight. Maximum height is 14’ feet. Makeup of the SA-series with 2 3/4″ thick panels that are better in reducing sound transfer. SA-2000 core has a 1/4″ dead air space between two pieces of 4.7# fiberglass and two sheets of 24 gauge steel Facings: acoustical fabrics. Uses multiple 3/8″ thick X 3″ wide floor tracks that are able to be permanently mounted. Maximum height is 14’ feet. SA-2500 core has a 1/4″ dead air space between two pieces of 4.7# fiberglass and two sheets of 24 gauge steel Facings: acoustical fabrics. Makeup of the SA-series with 2 3/4″ thick panels and that includes indexing storage systems. SA-3000 core has a 1/4″ dead air space between two pieces of 4.7# fiberglass and two sheets of 24 gauge steel Facings: acoustical fabrics. SA-5000 core has a 1/4″ dead air space between two pieces of 4.7# fiberglass and two sheets of 24 gauge steel Facings: acoustical fabrics. Unlike the competitor’s room dividers that require heavy beams or bracing in the ceiling, this system is floor supported and requires no additional bracing. In fact the lightweight top guide track can mount directly to a suspended ceiling. 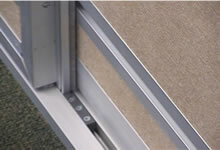 The SA-series bottom track comes in sections that are easily installed and removed. When the divider is not being used there is nothing on the floor. The bottom tracks can be stored vertically between the stacked panels and the wall as shown below. The SA-series is made up of individual panels that slide across a room in a stair step configuration. Each panel is automatically positioned by bumper stops in the tracks. When they are in position and overlap one another, a built in edge seal compresses between the panels and seals them for sound.